Sudbury Joggers were due to have about a dozen members out at 5 races, but the Beast from East Mark II had different ideas! 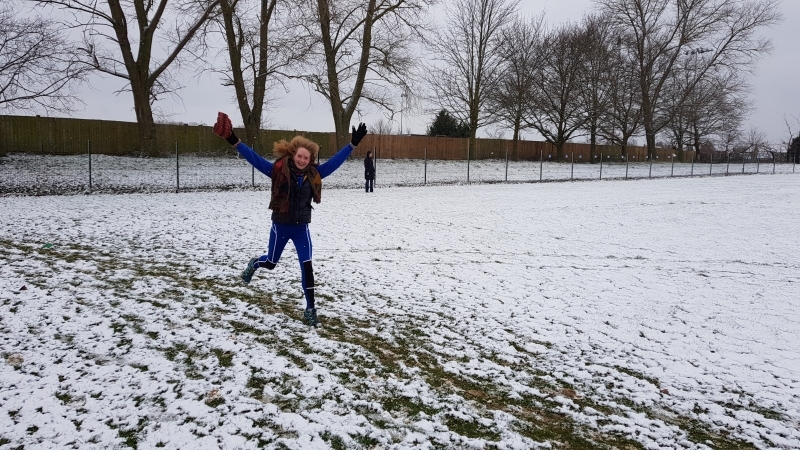 With snow and ice hitting the country, the Stowmarket Half Marathon, Colchester 15, Roger One Time Trials in Braintree and the Alloa Half Marathon in Scotland were all cancelled. The severe cold weather did not stop members of Sudbury Joggers getting out and doing some running. This included 20 runners joining 6 parkruns. One of the parkruns that our members attended was in Scotland; Jimmy Secker was up north for the Alloa Half Marathon, so he attended the Dunfermline parkrun. It is just a huge shame that the Alloa Half Marathon was cancelled the day after. 13 of our members attended the local Great Cornard parkrun and as you can see from the photo, they were still having fun despite the freezing conditions. Our very own Kieran Hayles was even the first over the Maldon Prom parkrun finish line in a time of 18 minutes and 55 seconds. With all the races that had been cancelled, there were still many that proceeded. One of those was the Brightlingsea Challenge Event from Hare & Tortoise Running. The Brightlingsea Challenge Event is a run along the Colne Estuary on the Essex coast where the challenge is to run as far as possible within 6 hours. Sudbury Joggers’ Gin Lawson and Dan Smith managed to run a full marathon in a little over 5 hours – what a great result. Another race that went ahead on Saturday was the Nant yr Arian Silver Trail Half Marathon in mid-Wales. Despite the -3°C temperature, David Chapman ran it in 2 hours and 40 minutes. Well done Gin, Dan and David on completing your races and to all those that braved the cold weather to do some running. Good luck to everyone running this coming week and lets us hope that we have better weather for the Sudbury Fun Run in a week and half.